A $2.5 million renovation and creation of a multi-purpose outdoor athletic and activity field at Holmes High School was celebrated in a ceremony on Thursday - ahead of the first home football game for the Bulldogs on the new field. The first football game at the stadium will be played Friday at 7 p.m. when Holmes takes on Bishop Brossart. The first soccer games at the field will be played on Saturday, at 5 p.m. and 7 p.m. The $2.5 million project replaces the natural grass at Tom Ellis Field, which was originally constructed in 1936 and had not seen a major upgrade since 1982. Because of the condition of that field, only about 20 events per year could be held at the old venue. The new synthetic turf field will be used not only by Holmes’s football, soccer, and track teams, but also by its marching band, physical-education classes, JROTC program, and other local high school and youth sports teams. The stadium also has a new scoreboard, track surface, press box, fencing, and other amenities. “In Covington, we believe that facilities such as this new stadium have a place in education,” said Covington Independent Public Schools Superintendent Alvin Garrison. “Facilities like this one play an important role in keeping our students engaged and active in the classroom and on the field. CIPS Personnel Director Eric Neff, who managed the construction project for the school district, said the new field will become a “real point of pride” for the entire Covington community. “The artificial turf installed at Holmes stadium is not just a beautiful backdrop on the Holmes campus for athletic events, but it makes this stadium a multi-purpose facility that requires zero recovery time and is immediately ready for the next event – whether it’s band practice, JROTC, track, or other activities,” Neff said. Neff said the versatile surface also is safer for the school district’s students and athletes. In 2014, the Tom Ellis Athletic Memorial (TEAM) Foundation started a capital fund-raising campaign to build the new stadium. Over the past three years, the Foundation raised more than $300,000 from individuals, businesses, and foundations to help pay for the project. The Tom Ellis Athletic Memorial Foundation is named after the man who was called “Big Daddy”, “Mr. Bulldog” and “Coach”. Tom Ellis, Sr. was one of the last in Kentucky to serve as head coach of football, baseball, and basketball, and as athletic director – all at the same time. He performed these multiple tasks at Holmes High School. Before coming to Holmes, Coach Ellis taught aeronautics, served as principal, and was football and basketball coach at Bardstown. He produced many outstanding teams. His 1946 football team at Holmes was awarded the state title, and he coached two Holmes basketball teams to the Kentucky Sweet 16. Ellis retired from education in 1973. He was named Coach of the Year twice and coached in several all-star games. Ellis was elected to the Northern Kentucky Sports Hall of Fame in 1984, the Kentucky High School Sports Hall of Fame in 1988, and the Greater Cincinnati Sports Hall of Fame in 1999. The Holmes High School football field is named in his memory. The TEAM Foundation also donated capital funding for the new Meinken All-Star Field, which was renovated in 2015 in conjunction with the Major League Baseball All-Star game held in Cincinnati that year. MLB and the Cincinnati Reds contributed half of the capital needed for the $800,000 renovation. The Motz Group served as the general contractor for the project and installed the new field. A.G. Sports Services installed the new track surface. Architect Ralph Cooper and PCA Architecture provided design services for the new facility. Corbitt Graphics designed the graphics on the wall and building at the stadium. CIPS maintenance and custodial staff also provided various services for the new field. In an unfortunate coincidence, Tom Ellis, Jr. died just days before the field that bears his father name was rededicated. The younger Ellis was 76 when he died on Saturday. After retiring from National Cash Register in 1992, he opened Duck Manor Promotions, which was based in Latonia and recently announced that it would close. 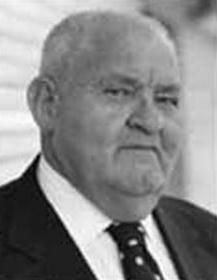 He was a past member of Western Kentucky Alumni Board, past president to the Ryland Lakes Country Club, board member of the Ft. Mitchell Country Club, and was part of many civic and charitable organizations including the Samaritan Society of St. Elizabeth, the Boy Scouts of America, and he was a Kentucky Colonel. Tom is survived by his loving wife, Liz Ellis. A visitation will take place on Saturday, August 26 from 9 a.m. until the funeral services begin at 10 a.m. at Trinity Episcopal Church in Covington. Any memorial contributions given should be made out to the TEAM Foundation c/o Holmes High School 2500 Madison Ave, Covington, Ky. 41014.